A Prom in which the Sao Paulo Symphony Orchestra and guest players from the Sao Paulo Jazz Symphony Orchestra celebrate Brazilian popular music. Afternoon on 3 - with Penny Gore. Another chance to hear the Late Night Prom from the São Paulo Symphony Orchestra, joined by guest players from the São Paulo Jazz Symphony Orchestra for a celebration of Brazilian popular music. 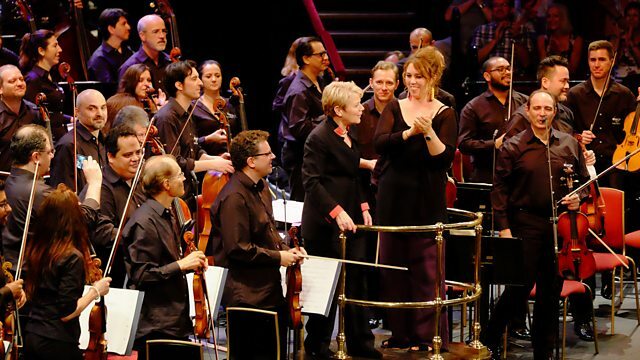 The São Paulo Symphony Orchestra's musicians and Principal Conductor Marin Alsop are joined by members of the São Paulo Jazz Symphony Orchestra for a landmark celebration of Brazilian popular-music from the past 100 years. Few countries can boast such an ingrained and individual popular music tradition as Brazil, and this feel-good Prom will take you from the African influenced rhythms and Chopinesque chromaticism of Brazilian street music to the outlandish constructions of the so-called São Paulo avant-garde - all from the best Brazilian players in the business. Orchestra: São Paulo Jazz Symphony Orchestra. Orchestra: São Paulo Symphony Orchestra. Conductor: Marin Alsop. Performer: Gabriela Montero. Orchestra: São Paulo Jazz Symphony Orchestra. Orchestra: São Paulo Symphony Orchestra. Conductor: Marin Alsop.